Ingredients: Litre of cider, apple studded with cloves, a couple of cinamon sticks, whole allspice, an additonal apple and a little drop of rum (optional). Follow the above recipe, excluding the rum, and add the peel of one orange, 4 table spoons of honey and a bit of cider brandy. Ingredients: 1/2 pint of cider, a couple of cloves, a little, chopped ginger, juice of half a lemon, a little bit of honey per glass. Pour the cider into a pan, add the cloves, ginger and lemon juice. Simmer for 15 minutes pour into a glass and add a little honey. 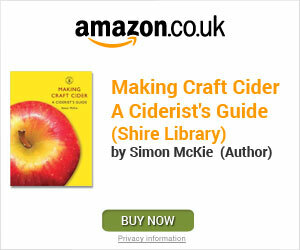 Ingredients: 1/4 -1/2 pint of cider, 50ml of Pimms, and a selection of chopped fruit e.g. strawberries, oranges, apples, grapes. Pour the Pimms and cider into a jug. Add some chopped fruit to it. Ingredients: 1/2 litre of dry cider, pork (about the quantiy of 4 med -large chops)large onion, 1 clove garlic, a couple of carrots, 4 cloves, a couple of bay leaves, large tsp of mustard (opitonal), pinch of salt and pepper, 50ml of cream. Chop the onion, garlic and slice the carrot. Chop the pork into chunks. Fry the onion lightly then add the garlic and pork. Lightly fry until sides of pork are sealed. Add the remaining ingredients. Simmer until pork is tender. Now add and stir in the cream and serve. Ingredients: Cumberland sausage, 1/4 litre of cider, 3-4 large cooking apples, tbsp of butter. Peel, core and cut the apple into thick slices. Add the butter to a pan and heat. Add the apples to the butter turning them gently as they cook (try not to break them. Cook until slightly soft. Lay the sausage on the apple slices. (If preferred you can fry/grill the sausage prior to adding to the apple). Add the cider and cook for approximatley 20-25 minutes.